The High Court has granted a permanent injunction against electronics wholesale company Cyber Maestro, in response to numerous complaints to the Singapore Tourism Board (STB) against the company’s trade practices. These included overcharging, exerting undue pressure or influence to enter into a transaction and misleading consumers about the prices and availability of goods, said STB in a press release announcing the granting of the injunction yesterday. The complaints did not cease despite notifications from the Consumers Association of Singapore (CASE) as well as requests to resolve the complaints amicably and refrain from further unfair trade practices, the tourism board said. CASE has listed Cyber Maestro among the top tenants in Sim Lim Square with the highest number of consumer complaints from July to September. The store, which is located at #02-77 of the building, has had seven complaints made against it. The New Paper reported last week that Mobile Air phone shop, which had been ordered by the Small Claims Tribunal to refund $1,010 to a woman, paid her back the amount in coins. The customer, Ms Zhou, had alerted the police, claiming that shop assistants had thrown a bag of coins, weighing 18kg, onto the floor and forced her to count the coins there. The shop owner apparently got worried halfway through when reporters appeared on the scene, and agreed to return her the rest of the money to her in notes. IN A bid to save its reputation, Sim Lim Square, a go-to place for electronic gadgets also known for the dubious sales tactics of some of its shops, has issued an unusual “appeal for urgent help”. In particular, its management has appealed to the authorities to “take a tough stand against the recalcitrant retailers”, saying it has been “disappointed with the apparent lack of measures which the authorities are able to take against these incorrigible retailers”. The appeal issued yesterday comes after the mall at Rochor Canal was criticised in recent weeks after a spate of media reports about cheating and overcharging involving shops there. This included a case involving a retailer which tried to give a customer more than $1,000 in coins after it was ordered by the Small Claims Tribunal to give a refund. In a statement yesterday, the retail complex’s management said errant shops have not been deterred despite “countless police reports” as well as complaints to others like the Consumers Association of Singapore (Case). “Law enforcement officers can be sighted in Sim Lim Square almost every day. However, the errant retailers are completely undeterred as the authorities appear to lack ‘teeth’ to take them to task,” it added. 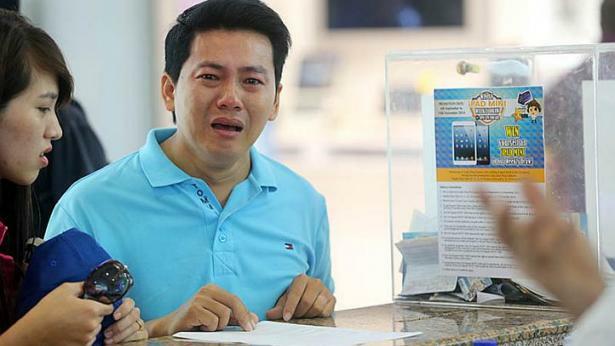 A Vietnamese tourist walked away from Sim Lim Square poorer by two months’ salary, and without the iPhone 6 he had hoped to get for his girlfriend. The incident is the latest dispute involving a mobile phone shop that made headlines earlier after it reportedly refunded a customer in coins. Mr Pham Van Thoai, a factory worker, was so desperate he knelt down to beg the shop employees to return his hard-earned cash, but only got refunded less than half of what he paid. “I’m only a factory worker, earning about $200 a month, $950 is a few months’ pay. It’s a large sum for me, I’m really very sad,” he said. He had been asked to sign an agreement, but did not scrutinise it as his English was not fluent, and he thought Singapore was a safe place to shop. “When they asked me if I wanted one year or two years’ warranty, I assumed that the one-year warranty was complimentary, so I said one year. He didn’t say I have to pay,” he told Zaobao. He was told that if he did not pay up for the warranty, he could not leave without the phone. 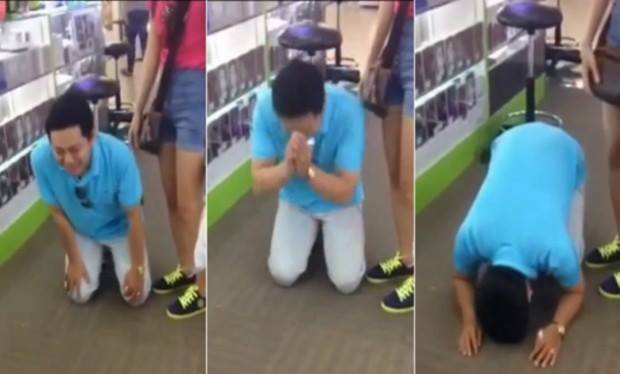 Mr Pham said he knelt down and begged for his money back, but they just laughed at him. ‹ Singapore is the new playground for the superich!